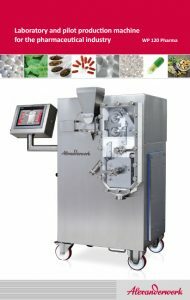 The WP 120 Pharma was specially designed by Alexanderwerk for use in pharmaceutical research and development areas, where it meets the highest requirements and standards. Minimum product quantities from 5 g as well as throughputs of up to 40 kg/h (lactose) can be processed with the standard roller width of 40 mm into granulates of various sizes. This enables use with special products and smaller batches in the pilot plant and in the small scale production area under constant and reproducible production conditions. Due to of its modular design, the process technology of the WP 120 Pharma can be completely disassembled without special tools. In addition, the modular design guarantees fast changing and cleaning of all working tools and meets the requirements for flexible production. The WP 120 Pharma is designed as a mobile unit and meets the demand for mobility and flexibility in the pilot plant operation. In order to ensure uncomplicated and fast operation at different locations, the control system and the operating unit are integrated in the machine. In addition, process parameters determined for a later production scale can be easily transferred to larger machines.